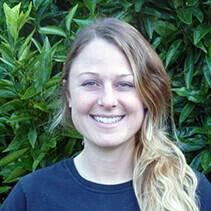 Christina (Tess) Hebebrand serves San Diego Zoo Global as a Research Assistant in Recovery Ecology. In this role, she helps with the daily care and propagation of birds at the Maui Bird Conservation Center and is involved with our fieldwork on Kauai for `akikiki and akeke’e. These small species of Hawaiian forest birds are native to Kauai and new to our program. Tess is excited to a part of research and conservation efforts for these two honeycreepers, about which little is known. As the`akikiki and akeke’e species captain at the Maui Center, Tess helps manage our captive populations, working with the team to prepare for the breeding season, as well as in the field. At the Center, Tess works with the `akikiki we hatched, giving them nesting opportunities in hopes of building our population. In the field, Tess participates in egg collection and hand-rearing for both species. She is excited to be part of the first ‘alala releases this coming fall. Tess earned her bachelor’s degree in Zoology from Colorado State University. She worked in the bird department at Denver Zoo for three years, caring for a wide range of avian species before joining the Hawaiian Endangered Bird Conservation Program. Growing up in Colorado, Tess has always loved nature and enjoyed being outdoors. She has always dreamed of being involved in animal conservation and feels very lucky to be able to do conservation work in Hawaii.